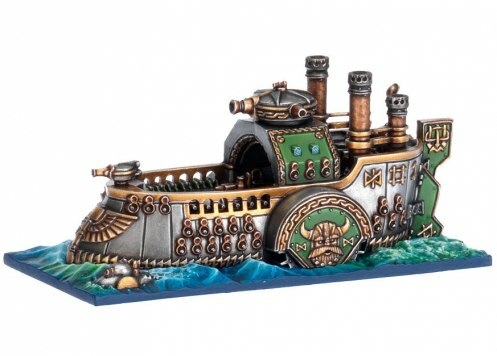 So, Games Workshop have released this year’s ‘mystery box’ product. Dreadfleet. Partly my apathy is due to the models, which I think form a perfect illustration of how Warhammer miniatures have become so stylised as to be almost cartoonish. The terrain pieces in particular – a selection of rocky outcrops featuring giant graven skulls – could have been lifted wholesale from an episode of He-Man and the Masters of the Universe. The Empire greatship meanwhile looks like it could snap in half under its own weight at any moment. Much to my own surprise I must may a preferred the old Man O War models, especially the Dwarf ships. But the models are a superficial problem. I’m more vexed by GW coming out with yet another superfluous vanity project that no one really asked for and charging people £70 for it. Two years ago, GW rereleased Space Hulk as a limited edition stand-alone box set. In that case, it made sense in that context as Space Hulk was originally designed as a single boxed game, and the rerelease incorporated all the elements from the old Genestealler and Deathwing expansions. It was essentially a complete replication of something that used to be available. Space Hulk also benefited from very good miniature designs. 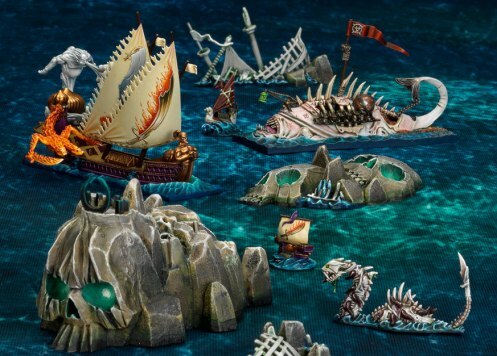 In the case of Dreadfleet however, GW seem to have tried to distil Man O War – a full blown wargame – into a boardgame version. I’m not sure how old Man O War Players will feel about this and whether they might be glad that their old game has been remade in any form at all or feel put out that it has come back in this stripped down almost tokenistic form. I’m not sure how many non-Man O War players will be interested, beyond the ‘new shiny’ syndrome or the ‘OMG it’s limited edition, grab it now!’ effect. Fundamentally though, I don’t understand why GW bothered with this. 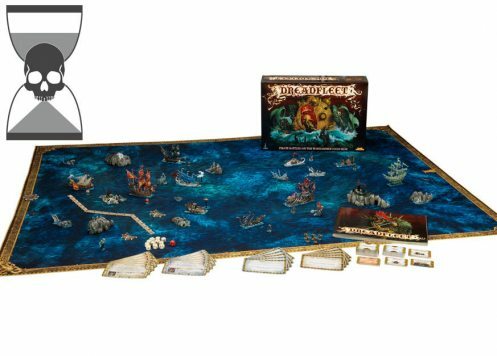 I doubt I’ll have the opportunity to play Dreadfleet so I’ll probably never know if it’s actually a good game or not – beyond the anecdotes of friends and tweeps. I’m sure that it could be a perfectly good game and worth the heft £70 price tag, but surely the effort put into making this game a good game could be better spent elsewhere? Am I the only one who thinks GW should be putting their time into supporting their existing games? Army books continue to trickle out of the design studio and I’m sure there must be players who would rather the designers get on with those rather than faff around with side projects that no one was really asking for. This is increasingly becoming my biggest grievance against Games Workshop, that they increasingly seems to be asking us to pay them to show off and indulge themselves rather than give their gamers the stuff they actually want and need – properly written and playtested rules, timely updates to army books, and all the stuff we actually need to play the core games day to day. People who play the GW Specialist Games have long had to accept that their games will get next to no support because GW is concentrating on its core range. They might well feel annoyed that GW have taken time out to resurrect a discontinued – and as I remember, somewhat flawed – game. Instead of giving their games any love. 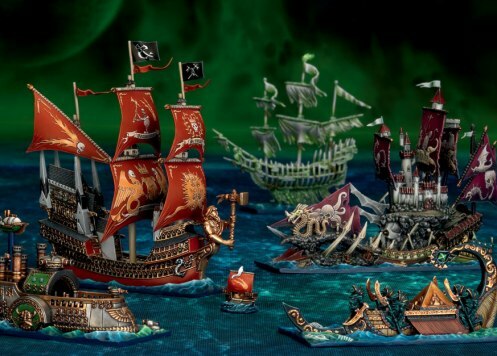 I don’t want to slam Dreadfleet as such, it could be a very good game, but to me it symbolises so much of what has come to repel me about Games Workshop. Doing what they what to do with no regard to what the customers might want or need. Indulging in vanity projects instead of maintaining quality in their core products and then making us pay for their fun. P.S. Happy International Talk Like a Pirate Day for tomorrow! As some of you will have read, I recently decided to stop buying products from the Games Workshop and explore other possibilities within the world of wargaming. The catalyst for this decision was price rises but it’s too simplistic to say that it’s simply a matter of cost. There are any number of hobbies that are expensive (the amount of money my wife sends on camera equipment is just one example of this fact). The problem is how much enjoyment I was getting in return for my money. If I had wanted to, I could have carried on purchasing GW products without breaking the bank, but realistically I would have been buying less each month as I opted not to squeeze a second box of something into my monthly budget. Mean that it would have taken me even longer to collect an army that I could take out and use. And here lies one of the real problems, it’s not just that GW products are expensive, it’s that you have to buy so many of them in order to field a legal army, let alone a decent one that uses a reasonable selection of options from the list. In contrast, f I played Warmachine, I could buy a faction battle box for about £35 and strictly speaking need never buy another model (though, let’s be honest, I still would). And then there’s the small matter of a table to play your table-top game on. On of the clever things Games Workshop did is try and turn themselves into a one-stop-shop for all their customer’s need from toys to paint to terrain and even the table itself. If I was being cynical, I might venture to suggest that this strategy was not just a cunning means of extracting more money, but also a way of keeping their customers unaware of other options. If GW customers had to trawl the net in search of terrain, they might discover the other games that the independent terrain companies also cater for. Of course GW terrain is very good quality, as are all GW products, but so is Amera terrain and I can buy that for about half as much if not less. And herein lies something that has started to bother me about GW is that it’s not simply that I feel that I’m being overcharged, It’s that I feel I’m having to pay for a level of quality that I didn’t ask for, but that GW insist on providing because it pleases themselves. For example, the Eighth Edition Warhammer Fantasy Battle Rulebook is an example of sumptuous production values, full of exquisite artwork and beautifully composed photography. But it is also a very large, quite heavy hardback volume which is perhaps not entirely practical or desirable in a wargaming rulebook. The solution might be to acquire the softback mini-rulebook in the Isle of Blood box, which also requires you to purchase a number of exquisitely detailed models for two out of the fifteen armies currently available for WFB. Similarly, though the new Citadel Finecast is probably a good thing for hobbyists, it’s not as if the gaming community was universally clamouring for it or that their customer base would have deserted them if they hadn’t brought it out. The fact that the introduction of Finecast coincided with a hefty across-the-board price rise rather makes it feel like we are having to pay for an innovation that we weren’t actually that bothered about them bringing in. I realise that prices have to rise and businesses have to make a profit but I was always under the impression that profit was for reinvesting in innovations like this rather than pouring out to shareholders while you ask the customers to pay for something most of them never asked for. Too often I feel that the ‘quality’ we pay for takes the form of a quarter of a box full of decorative options we will never use. Meanwhile some fantasy models have become so stylised and exaggerated that they have become just a little bit ridiculous and undermine the surprising almost paradoxical sense of realism Warhammer used to have. And while we all recognise they way GW pushed the envelope of miniature making technology to produce the Bane Blade, Shadow Sword and Stompa, they pushed the envelope in a way that not that many people were demanding and which allowed them to sell an expansion which served to further encourage spending lots of money on a big army. Just once I’d like to see some evidence that they were investing in making the hobby better for gamers rather than in vanity projects that lead to more stuff they can hock to us. So this weekend, I have ordered what could be my last GW purchases ever. My Brazen Angels are the most successful hobby project I’ve undertaken in years and I want to round them up to an even 2000 points, even if I never do the 3000 point Land Raider based assault army I originally planned. So I will finish them, and I will paint them and put them upon display. Depending on how my forays into other games turn out and the amount of hobby time the imminent birth of my first child allows it’s entirely possible I might never play a game with them. But if I do, it will be on a gaming table from B&Q, decorated with Amera scenery.